On Jan. 1, 2016, the U.S. Environmental Protection Agency (EPA) implemented new and stricter ENERGY STAR criteria for the energy performance of residential windows. Beyond enhancing the energy efficiency of American homes, these new standards were developed to make it easier for you to identify and purchase windows that will maximize energy savings and enhance the comfort of your home. Implemented by the EPA in 1992, ENERGY STAR is a voluntary labeling program established by the EPA to identify and promote the use of energy-efficient products. Originally intended for computers and monitors, the program now encompasses 11 product categories ranging from air conditioners and appliances to televisions and fans. One of the 11 categories is residential windows. The ENERGY STAR labeling program makes it easy to purchase energy-efficient windows. 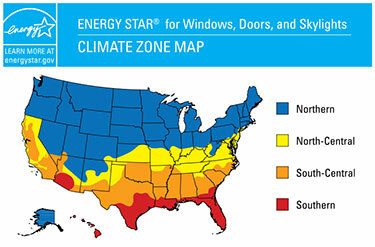 All ENERGY STAR-certified window labels show a map of the U.S., indicating the specific climate zones in which that particular window assembly is certified. If ENERGY STAR certification is the only performance criteria you want to consider for a residential window, the climate zone map will provide the only information you will need. However, not all ENERGY STAR-certified windows are created equal. If you want to earn a quicker payback on your investment in energy-efficient windows, it pays to have a firm understanding of what the NFRC (The National Fenestration Ratings Council) label can tell you about a window’s potential performance. NFRC is a third-party organization that tests windows and window systems. Their ratings are used to determine if a residential window meets ENERGY STAR standards, and the test results they generate for each window are published on every ENERGY STAR-certified window label. Knowing how to read the NFRC label can help you compare ENERGY STAR-certified windows to determine the best choice for your home. 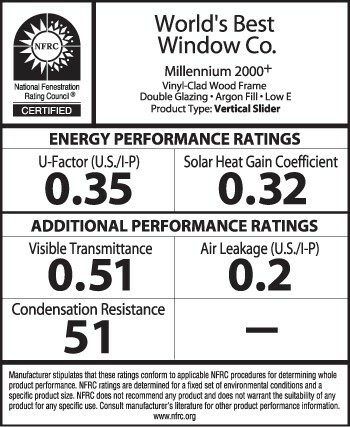 NFRC labels list window performance ratings in five specific categories, yet only two are related directly to energy performance: U-factor and solar heat gain coefficient (SHGC). U-factor (or U-value) is a scientific measure of heat transfer that quantifies how well a window insulates (or traps heat in) your home. Most windows have U-factors of 0.20 to 1.25. Windows with low U-factors are better at preventing heat transfer than windows with high U-factors. The ability to trap heat is a desired characteristic for windows in the northern and north/central climate zones because they can help homeowners reduce furnace-related energy use in the winter. For that reason, windows designed to achieve ENERGY STAR certification in the northern climate zone must achieve U-factors of 0.27 to 0.30 or less depending on their SHGCs. While U-factor measures how well a window insulates, SHGC quantifies – on a scale of 0 to 1 – how effective it is at preventing heat from entering a home. Roughly speaking, windows with a SHGC of 0.25 keep 75% of the sun’s heat energy from being transmitted into a home, while a window with a SHGC of 0.75 blocks only 25% of the ambient solar energy. If you live in the southern and south/central climate zones, windows with low SHGCs will earn ENERGY STAR certification because they block solar heat and help reduce the cooling load on your air conditioner. Conversely, if you live in the northern climate zone, windows with higher SHGCs are eligible for ENERGY STAR certification because they transmit more solar energy into your home, supporting your furnace during the winter and reducing its energy consumption. In the southern and south/central climate zone, the minimum prescribed SHGC for ENERGY STAR-certified windows is 0.25. In the northern climate zone, where solar heat gain is desired, there is no minimum SHGC. In the north central climate zone, the U-value must be 0.40 or less to earn ENERGY STAR certification. NFRC labels list three additional performance factors, including visible light transmittance (VLT), air leakage and condensation resistance. Air leakage is the only one with prescribed ENERGY STAR performance criteria, but it is the same for all climate zones. NFRC labels can provide important clues about the best window for your home. If you’re buying windows for a home in a warm climate dominated by air conditioning, look for units with the lowest possible SHGC. Even a small difference in this solar control rating can make a potentially big difference in your energy savings. If you live in a cold climate, window systems with lower U-factors generally provide a quicker return on your investment. Even better are window systems that combine low U-factors for insulation with higher SHGCs for heat transmittance. Which Vitro Architectural Glass is the Best Choice for my Residential Windows? If you want proven, high-performance glass for the window units in your home, few names are more trusted than Vitro Architectural Glass (formerly PPG glass). North America’s first and largest glass manufacturer, Vitro glass makes a variety of solar control and passive low-e glasses for residential window applications. The following chart highlights individual low-e glass products by Vitro Glass with center-of-glass performance values that meet prescribed ENERGY STAR criteria in each of the four U.S. climate zones without the assistance of other window components. When specified in combination with energy-efficient framing systems, insulating spacers or insulating gases, the performance of these products can be maintained or enhanced, enabling window manufacturers to meet and exceed ENERGY STAR performance criteria. To achieve ENERGY STAR certification in this climate zone, residential window units must achieve a U-factor of 0.30 or less and a SHGC of 0.25 or less. All low-e glass products by Vitro Glass offer center-of-glass performance that meets these thresholds. To achieve ENERGY STAR certification in this climate zone, residential window units must achieve a U-factor of 0.40 or less and a SHGC of 0.25 or less. All low-e glass products by Vitro Glass offer center-of-glass performance that meets these thresholds. To find a manufacturer offering ENERGY STAR-certified windows with Vitro glass in your area, visit www.vitrowindowglass.com or call 1-855-887-6457.